Introducing our 100% Natural Bitter Arpicot Kernel Seed Extract which has been organically grown and produced. Each Batch of our Natural Organic Extract has been concentrated to a strength of 25:1 providing you a Natural Organic Extract yet with an added boost of it's own natural ability simply concentrated for a more dependable extract preserving all it's natural Vitamin and Mineral Content such as it's natural "Amy" content as well as it's natural rhodium content. 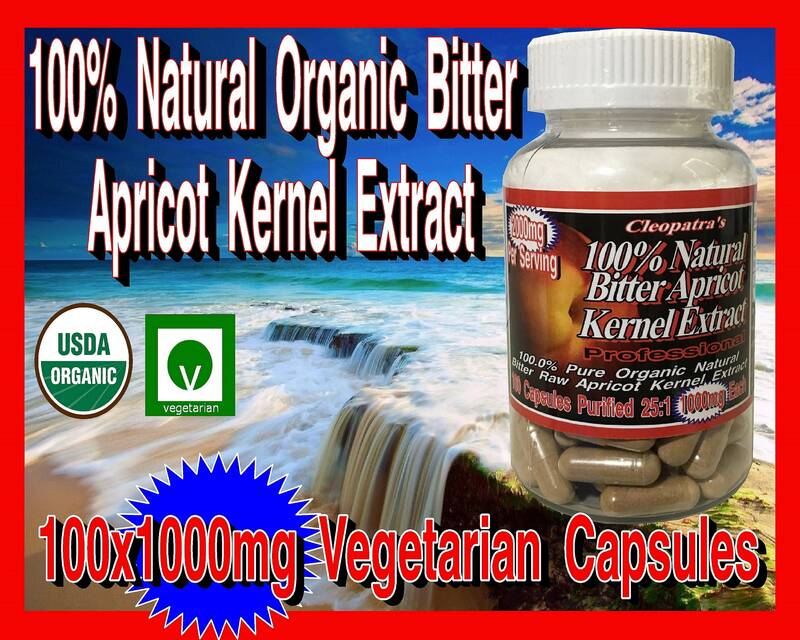 Each Vegetarian capsule contains 1000mg's, and each jar contains 100 Capsules. Each dose is 2000mg's. 100% Natural Apricot Content with 0% Fillers, Preservatives, Sugars, Sweeteners, Chemicals, Rice, Flour, Radiation, Additives, GMO, just simply natures pure Apricot Kernel Extract Organically Grown, Harvested and Produced.